What to do with all my books? This is a question that had always dogged me throughout my life which was mainly due to the fact that I have lived a very mobile existence since I flew the nest. I having made homes in ten different cities in four different countries since 1985. I have always been a hoarder of books as I was also a hoarder of music. I am a major fan of both. Each time I have moved it seems that I lost loads of books and albums, not to mention having loaned a helluva lot of these out to have never been returned. Now I am looking at the possibility of going mainly book free and it scares me a little and excites me at the same time. I have been pretty public about the fact that after so many years I am finally, FINALLY, starting to read ebooks. When I reluctantly switched from my Nokia C-7000 (still a damned good phone) to my iPhone late summer I tested the waters by reading a few books on iBooks. And I was hooked! 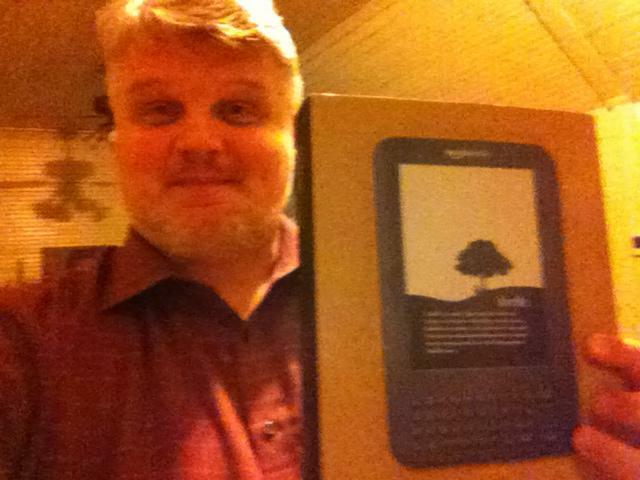 Now I own my own Kindle and am hoarding (and reading) loads of books again. Oddly enough, I am reading more books than I did before – or at least in the past few years. Why? Because I always have books with me now. Always. I read when I am waiting on a friend. I read at lunch. I read in the bathroom. I read on the airplanes, in the airports, on the Bangkok BTS (sky train), in taxis. And in bed. The bottom line is that I have found more places to read than I ever have before. And I am enjoying it. Last year, in Johannesburg, I bought a nice computer carrying pull along bag. I used to load it with six or seven books per trip. Not anymore. So now what to do with my books? I realize that I have still to read several of them and many I don’t want to give up. So I am very reluctant to get rid of the books that are around my house. I also worry that if I got rid of the books around the house that I would discourage the children from reading. (Is that unfounded?) I have read several blogs from people who I have followed and respected who have claimed they were going completely "bookless" now and I have been thinking whether this is a real option myself, especially as an erstwhile writer. My mind isn’t fully wrapped around this yet. Going bookless could definitely unclutter my home and office. But I have always believed that the world was just so much better with books around. Am I a dinosaur who is struggling against the inevitable or is my reluctance from a rational perspective. I think I will feel this out as I go along. But one thing I do know is that I am enjoying the hell out of ebooks right now and I am sure that this will continue. Like so many others I never wanted to “give up” on books but I have been thinking more and more about it since getting my iPhone. I fell in love with the iBooks application and within a few weeks I was convinced to the new Kindle Fire which is coming out soon but when I was in New Orleans recently I had lunch with Benny Lewis who convinced me that the Kindle Keyboard 3G is a damned good way to go. Oddly enough, talk about law of attraction, a week later I was visiting my aunt in Springhill, Arkansas, and my cousin, Nick Hammond, told me that he won this exact model but he doesn’t read much so he never even opened the box. I couldn’t believe my luck! I asked him what he’d sell it to me for and he said fifty bucks. Fifty bucks? Done deal! I was just hoping that he didn’t re-think it and back out. Actually, he told me that several people had offered him money for the Kindle but none ever came through on it. Not me. As soon as Nick said fifty bucks my hand was in my back pocket reaching for my wallet.